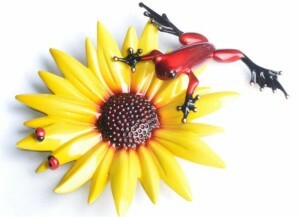 Spring comes early with Tim Cotterill’s 11th release in the much anticipated Mother’s Day flower sculpture series. Sunflower is sure to shine bright among your collection. Frogman have just announced this gorgeous new sculpture from Tim Cotterill – Sunflower. 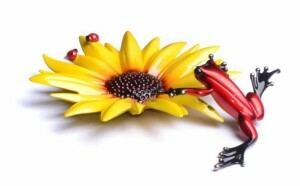 In vibrant colours of red and yellow, the flower is a pastel patina and the red on the frog is created by producing a high polish to the bare bronze and then adding the colour, to give it this very deep rich red lustre. Available in a general edition of 1000 or as an Artist Proof of only 100. This entry was posted in Flower Sculpture by Bronze Frogs. Bookmark the permalink.